On this particular Sunday morning, the Secret Service agent could perceive that the young man accused of murder sitting before him likes to talk about himself and express his opinions. Perhaps this would be the key to finding the truth about the charges brought forth against him. “What do you think about religion?” he asks the young man. “Karl Marx is my religion,” replies the accused. “What I mean is, what faith are you?” the Secret Service agent inquires. The young man is in his element, and lights up at the chance to talk about ideology. “Most definitely so,” he answers. 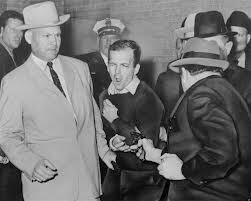 The young man’s name was Lee Harvey Oswald, and the Secret Service agent was Inspector Thomas J. Kelley, flown into Dallas from Washington, D.C. Oswald was charged with assassinating President John F. Kennedy and murdering Dallas police officer J.D. Tippit two days prior on November 22, 1963. The above conversation between them actually took place as cited above in the third-floor homicide office of the Dallas City Hall on Sunday, November 24, 1963, at about a little after 10:45 a.m.
About thirty-six minutes after stating that God’s Word is not “a reasonable or intelligent philosophy,” Lee Harvey Oswald was fatally shot by Jack Ruby while being transferred to the Dallas County Jail. This entry was posted in Jon Mitchell and tagged bible, god, mock, oswald. Bookmark the permalink.